Duane was looking for an option to match the modern style of his house in Los Angeles, CA. He chose our Miami Square cable railing system with a handrail leading up each side of the stairs. 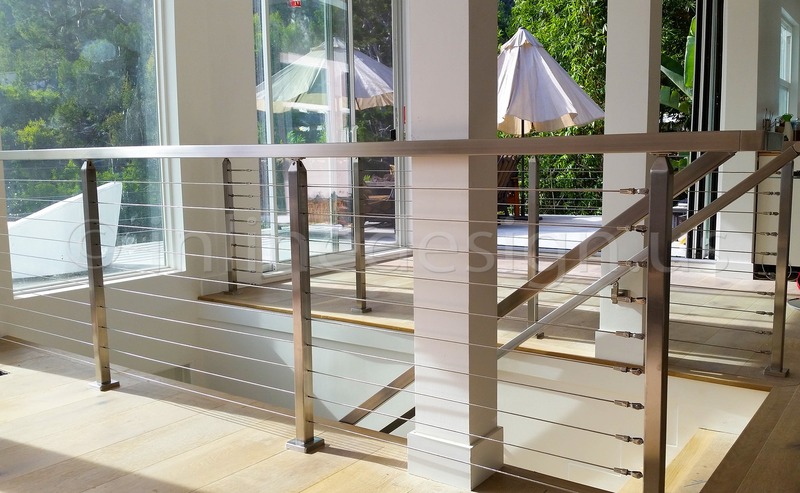 Many of our customers want a continuous railing throughout the entirety of their space. The u-turn design at the top of the stairs achieves this magnificently. This symmetrical design uniquely uses our Stainless Steel Handrail Wall Bracket Square Magnetar, (U.S. Design Patent No. D806,524) on the wall and support beam, ultimately connecting the stair handrails to the flat run on the landing by use of the Stainless Steel Flush Angle Square Adjustable for seamless transition. Flawless! No two projects are the same. While Duane opted for the continuous railing, you can see that our Jorge – MO project was installed differently. A span of handrail going up the stairs does not have to connect to a flat run; in some cases, it’s almost impossible. Our sales and production team can walk you through your options and advise you in achieving the look you desire.